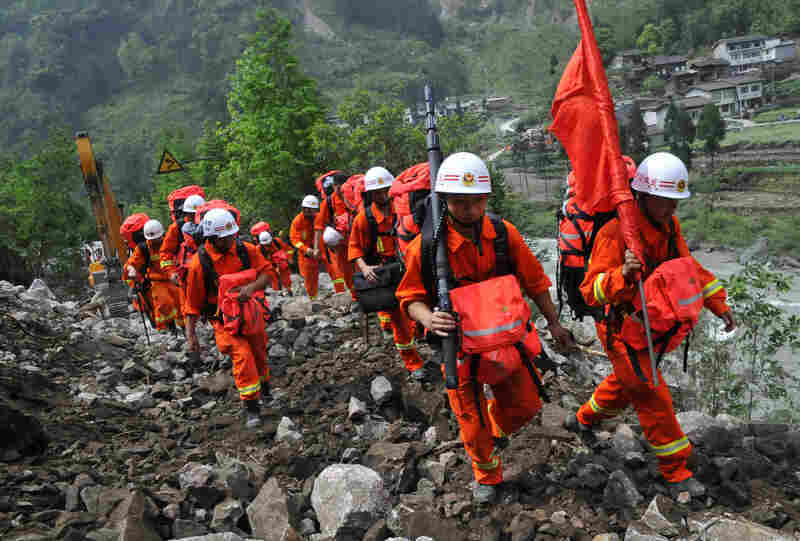 Battling Obstacles, Chinese Relief Crews Seek Quake Victims : The Two-Way Landslides and congested roadways are hindering rescuers' progress as they make their way to rural communities in Sichuan Province. The earthquake Saturday, which killed at least 186, is a test of the new leadership's response to natural disaster. Chinese rescuers walk through wreckage to reach isolated Baoxing country after the earthquake in Ya'an, southwest China's Sichuan province on Sunday. Volunteers enter Longmen township in Ya'an, southwest China's Sichuan Province, on Sunday. 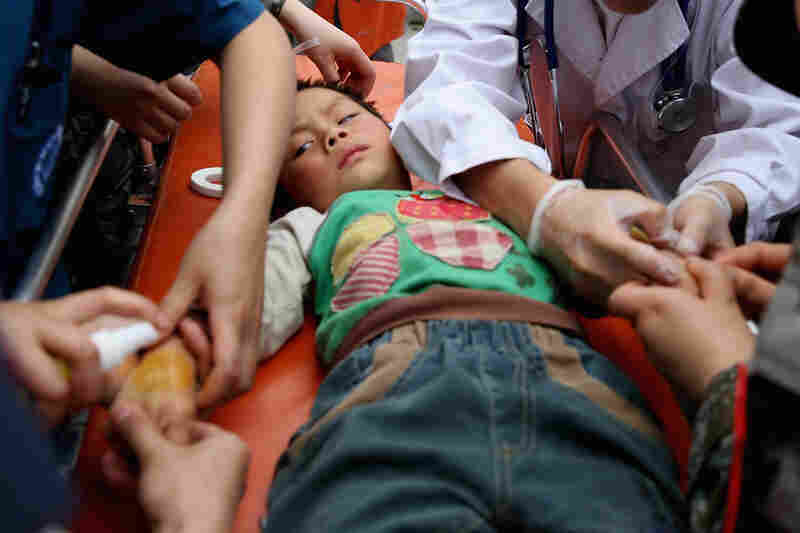 Medical officers treat a patient at the hospital on Sunday in Lushan of Ya'an. 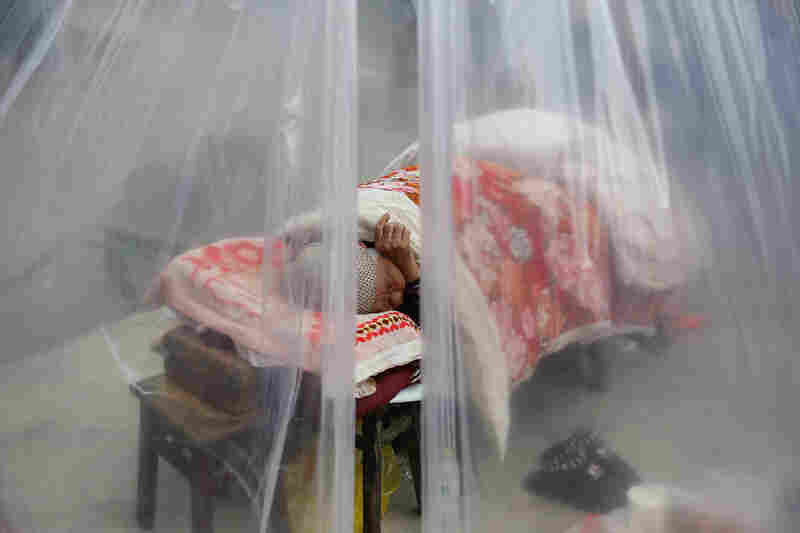 An earthquake survivor sleeps in a tent on Sunday in Lushan. 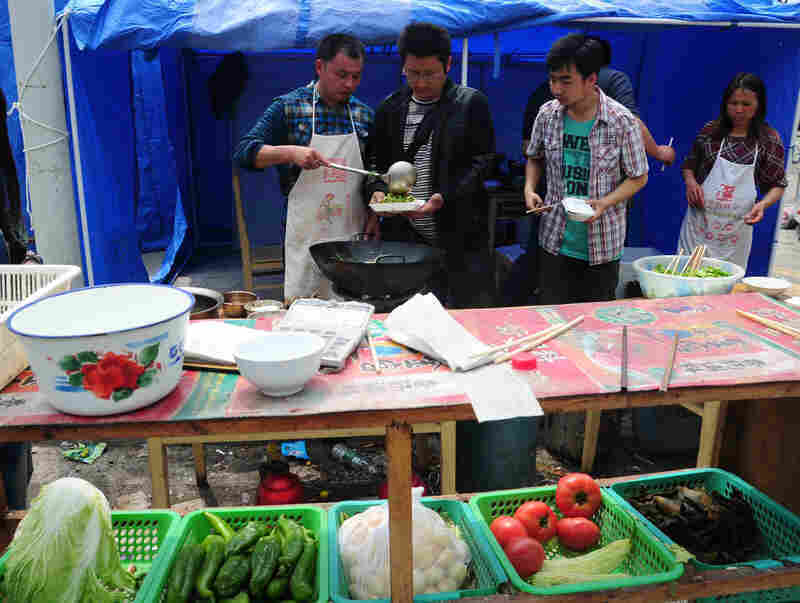 Food is prepared in a temporary settlement in Longmen township, a town close to the epicenter of the earthquake. 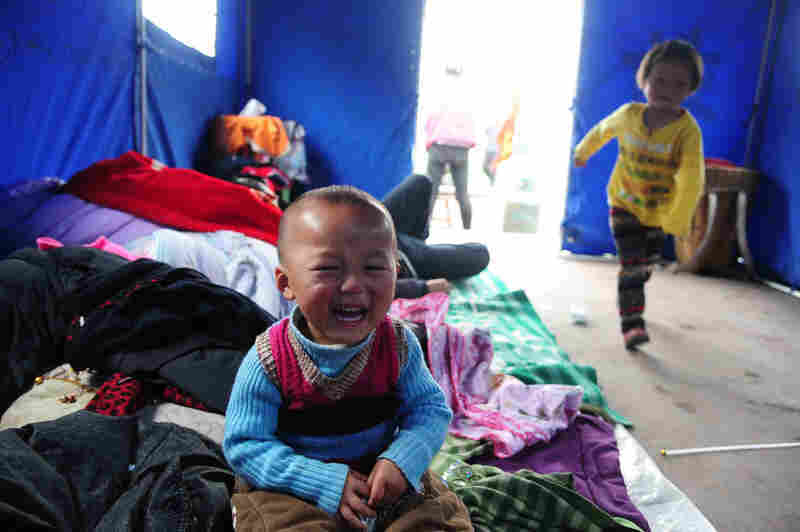 Displaced families occupy tents in the temporary settlement. 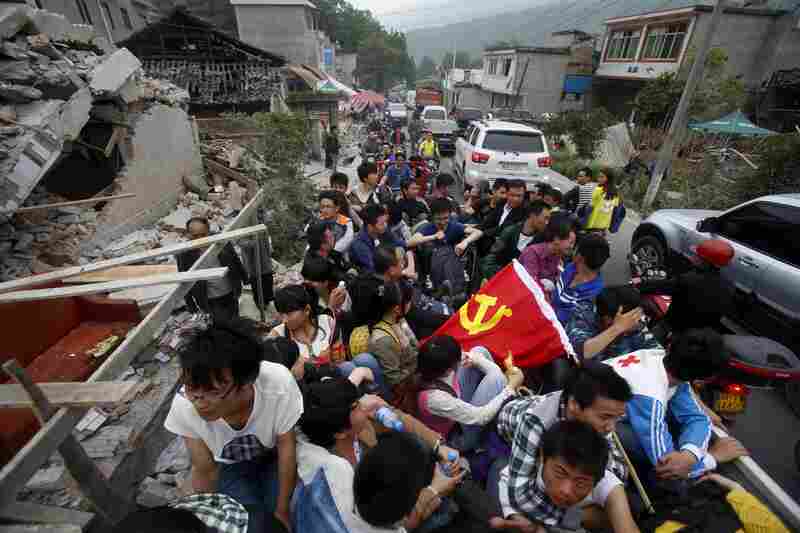 "We lost everything in such a short time," a Chinese college student tells The Associated Press. An earthquake in southwestern China Saturday caused his family's home to collapse, crushing his grandfather. Xinhua news agency reports at least 186 people were killed by the quake, more than 11,000 were injured and nearly two dozen are missing. "Rescuers' progress was hampered by the narrowness of the road and landslides, as well as government controls restricting access to avoid traffic jams." Kevin Xia of the International Federation of Red Cross and Red Crescent Societies tells Reuters, "Most of our supplies are still on the way." In 2008, a larger earthquake shattered the same province, killing thousands. The Red Cross reports that the stronger buildings constructed since that quake "are largely standing, at least in the county town, although many are cracked." This time around, Al Jazeera's Robert McBride says, "People are now watching to see how the new leadership is dealing with this. This their first test of how they deal this natural disaster." "You are bearing a heavy mission since this hospital has taken in the largest number of seriously-injured people from the quake zone and they have trusted you with their life and health. I believe through your efforts patients will recover as early as possible. This is also what people across the country expect." A statement issued by Secretary-General Ban Ki-moon's spokesperson said the United Nations "stands ready to provide assistance and to mobilize any international support that may be needed."